Brown bear is the common name for a large bear, Ursus arctos, ranging in color from a common brown to yellowish or black fur and having a noticeable shoulder hump and a concave face. The most widely distributed member of the bear family, Ursidae, it is found in much of northern Eurasia and North America. Other well-known common names for various subspecies or populations include grizzly bear, Kodiak bear, Alaskan brown bear, Russian brown bear, Asiatic brown bear, Himalayan snow bear, and European brown bear. The brown bear sometimes is referred to as the "bruin." The brown bear is a massive animal, weighing between 100 and 700 kilograms (220-1,500 pounds) and its larger populations, such as the Kodiak bear, match the polar bear as the largest extant land carnivores. While the brown bear's range has shrunk, and it has faced local extinctions, it remains listed as a least concern species with a total population of approximately 200,000. Its principal range countries are Russia, the United States (especially Alaska), Canada, and Finland. While encounters with the brown bear in the wild can be dangerous for humans, these remarkable animals also add greatly to the wonder of nature and are prized sightings on ecotours. They also are popular trophies in sports hunting. Once sought for their meat and hides, they are less commonly used for such purposes. Extraction of bear bile, used in Traditional Chinese Medicine (TCM), is reported to involve a great deal of cruelty for the animals (see bile). A Eurasian brown bear running. Brown bears have heads that are large and round with a concave facial profile, a characteristic used to distinguish them from other bears. Their snout protrudes from this concave or "hollow" face (Grzimek et al. 2004). They also have a large hump of muscle over their shoulders (Grzimek et al. 2004), which helps to distinguish them from such species as the black bear (Ursus americanus), which lacks this characteristic hump (Cameron 2005). Their tail is short, 10 to 13 centimeters (4 to 5 inches) long (Brown 1993). The forearms of brown bears end in massive paws with claws up to 15 centimeters (6 inches) in length, which are mainly used for digging. Brown bear claws are not retractable, and have relatively blunt points. Like all bears, brown bears are plantigrades and can stand up on their hind legs for extended periods of time. Brown bears have fur in shades of brown, black, tan or blond, or a combination of those colors. The longer outer guard hairs of the brown bear are often tipped with white or silver, giving a "grizzled" appearance. Brown bears are large and very powerful, and can break the backs and necks of large prey. Males are 38 to 50 percent larger than females (Brown 1993). The normal range of physical dimensions for a brown bear is a head-and-body length of 1.7 to 2.8 meters (5.6-9.2 feet) and a shoulder height 90 to 150 centimeters (35-60 inches). The smallest subspecies is the Eurasian brown bear with mature females weighing as little as 90 kilograms (200 pounds) (Wood 1983). Barely larger, [grizzly bear]]s from the Yukon region (which are a third smaller than most grizzlies) can weigh as little as 100 kilograms (220 lb) in the spring (BF), and mature females of the Syrian brown bear weigh as little as 150 kilograms (331 pounds). The largest subspecies of the brown bear are the Kodiak bear, Siberian brown bear, and the bears from coastal Russia and Alaska. It is not unusual for large male Kodiak bears to stand over 3 meters (10 feet) while on their hind legs and to weigh about 680 kilograms (1,500 lb). The largest wild Kodiak bear on record weighed over 1,100 kilograms (2,500 pounds) (Brown 1993). Size seems related to food availability, with subspecies distinctions being more related to nutrition rather than geographical location (Macdonald 1984). Bears raised in zoos are often heavier than wild bears because of regular feeding and limited movement. In zoos, bears may weigh up to 900 kilograms (2,000 pounds). Brown bear at Brooks Falls. The most widely distributed ursid (McLellan et al. 2008), the brown bear has a global distribution, with populations in North America, Europe, northern Asia, and Japan (Grzimek et al. 2004). It occupies about 5 million square kilometers of North America, 800,000 square kilometers of Europe (excluding Russia), and much of northern Asia (McLellan et al. 2008). There are about 200,000 brown bears in the world. The largest populations are in Russia, with 120,000, the United States with 32,500, and Canada with 21,750. Ninety-five percent of the brown bear population in the United States is in Alaska, though in the western United States they are repopulating slowly but steadily along the Rockies and plains. In Europe, there are 14,000 brown bears in ten separate fragmented populations, from Spain in the west, to Russia in the east, and from Scandinavia in the north to Romania, Bulgaria, and Greece (with about 200 animals) in the south. They are extinct in the British Isles, extremely threatened in France and Spain, and in trouble over most of Central Europe. The brown bear is Finland's national animal. The Carpathian brown bear population is the largest in Europe outside Russia, estimated at 4,500 to 5,000 bears. Brown bears were once native to the Atlas Mountains in Africa, and may have existed as late as the mid-1800s in Algeria and Morocco and as late as 1500s in the Sinai of Egypt, but are not extinct in these areas (McLellan et al. 2008). They also were once in Mexico, but were extirpated there and in a large portion of the southwestern United States during the twentieth century (McLellan et al. 2008). Although many hold on to the belief that some brown bears still may be present in Mexico and the Atlas Mountains of Morocco, both are almost certainly extinct. The last known Mexican brown bear was shot in 1960. Very small numbers remain in Iraq and Nepal, but they have apparently been eliminated from Syria and possibly Bhutan (McLellan et al. 2008). Brown bears live in Alaska, east through the Yukon and Northwest Territories, south through British Columbia and through the western half of Alberta. Small populations exist in the Greater Yellowstone ecosystem of northwest Wyoming (with about 600 animals), the Northern Continental Divide ecosystem of northwest Montana (with about 400-500 animals), the Cabinet-Yaak ecosystem of northwest Montana and northeast Idaho (with about 30-40 animals), the Selkirk ecosystem of northeast Washington and northwest Idaho (with about 40-50 animals), and the North Cascades ecosystem of north-central Washington (with about 5-10 animals). These five ecosystems combine for a total of roughly 1,200 wild grizzlies still persisting in the contiguous United States. Unfortunately, these populations are isolated from each other, inhibiting any genetic flow to occur between ecosystems. This poses one of the greatest threats to the future survival of the grizzly bear in the contiguous United States. The population of brown bears in the Pyrenees mountain range between France and Spain is so low, estimated at fourteen to eighteen with a shortage of females, that bears, mostly female, from Slovenia were released in the spring of 2006 to alleviate the imbalance and preserve the species' presence in the area, despite protests from French farmers. In Arctic areas, the potential habitat of the brown bear is increasing. The seeming warming of that region has allowed the species to move farther and farther north into what was once exclusively the domain of the polar bear. In non-Arctic areas, habitat loss is blamed as the leading cause of endangerment, followed by hunting. North American brown bears seem to prefer open landscapes, whereas in Eurasia they inhabit mostly dense forests. It is thought that the Eurasian bears that colonized America were tundra adapted, something indicated by brown bears in the Chukotka Peninsula on the Asian side of Bering Strait, which are the only Asian brown bears to live year-round in lowland tundra like their American cousins (RHA 2007). The brown bear is primarily solitary animals, although they may gather in large numbers at major food sources and form social hierarchies based on age and size (Dewey and Ballenger 2002; Grzimek et al. 2004). They may be active at any time, but primarily forage in the morning and at dusk, and rest during the day (Dewey and Ballenger 2002). Female Cantabrian brown bear and cubs. With kind permission of Fapas (Conservation NGO - Foundation for the Protection of Wild Animals). The mating season takes place from late May through early July. Being serially monogamous, brown bears will remain with the same mate from several days to a couple of weeks. Females become sexually mature between the age of 5 and 7 years, while males will usually not mate until a few years later when they are large and strong enough to successfully compete with other males for mating rights. Through the process of delayed implantation, a female's fertilized egg will divide and float free within the uterus for six months. During winter dormancy, the fetus will attach itself to the uterine wall and the cubs will be born after an eight-week period while the mother sleeps. Should the mother not gain enough weight to survive through the winter, the embryo will not implant and be reabsorbed into the body. The average litter number is between one and four, with two being the most common number, though there have been cases of bears with five cubs, though it is not unusual for females to adopt strange cubs. The size of a litter depends on a number of factors, such as the age of the mother, geographic location, and food supply. Older females tend to give birth to larger litters. The cubs are born blind, toothless, hairless and weigh less than 1 pound at birth. They feed on their mother’s milk until spring and as late as early summer depending on climate conditions. The cubs, which will weigh from 15 to 20 pounds at this time, will have developed enough to follow her and begin to forage for solid food. Cubs will remain with their mother from two to four years, during which time they will learn survival techniques such as which foods have the highest nutritional values and where to attain them, how to hunt, how to fish, how to defend themselves and where to den. The cubs learn by following and imitating their mother’s actions during the period they are with her (SOTB). Brown bears engage in infanticide (Bellemain et al. 2006). An adult male bear may kill the cubs of another bear either to make the female sexually receptive or simply for consumption. Cubs will flee up a tree when they sight a strange male bear and the mother will defend them even though the male may be twice her size. 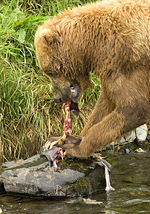 Brown bear feeding on salmon. Brown bears are omnivores and feed on a variety of plant products, including berries, roots, and sprouts, as well as fungi and meat products such as fish, insects, and small mammals. Despite their reputation, most brown bears are not particularly carnivorous as they typically derive up to 90 percent of their dietary food energy from vegetable matter (DCED). Their jaw structure has evolved to fit their dietary habits. The diet of brown bearns varies enormously throughout their differing ranges. For example, bears in Yellowstone National Park during eat an enormous number of moths during the summer, sometimes as many as 40,000 in a day in August, and may derive up to half of their annual food energy from these insects (Reed 2006). Locally, in areas of Russia and Alaska, brown bears feed mostly on spawning salmon, and the nutrition and abundance of this food accounts for the enormous size of the bears from these areas. Brown bears also occasionally prey on deer, elk, moose, caribou, and bison. When brown bears attack these animals, they tend to choose the young ones since they are much easier to catch. When hunting, the brown bear uses its sharp canine teeth for neck-biting its prey. On rare occasions, bears kill by hitting their prey with their powerful forearms, which can break the necks and backs of large prey, such as bison. They also feed on carrion and will use their size to intimidate other predators such as wolves, cougars, and black bears from their kills. Brown bears will often use their large size to intimidate wolves from their kills. Though conflict over carcasses is common, the two predators will, on rare occasions, tolerate each other on the same kill. Given the opportunity, both species will prey on each other's cubs. 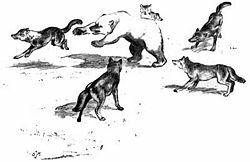 Reconstruction of a brown bear confronting a wolf pack by Adolph Murie (1944). Adult bears are generally immune from predatory attacks from anything other than another bear. Some bears emerging from hibernation have been known to seek out tigers in order to steal their kills (Matthiessen and Hornocker 2001). However, in the Russian Far East, brown bears, along with smaller Asiatic black bears, constitute 5 to 8 percent of the diet of Siberian tigers (Mazak 1983). In particular, the brown bear's input is estimated as 1 to 1.5 percent. However, tigers prefer to contest brown bear sows (Seryodkin 2006). For the tiger, even bears of the same size are a force to be reckoned with when confronted head on. There are 12 known incidents when Siberian tigers were killed and eaten by brown bears (Seryodkin et al. 2005; Seryodkin 2006). Brown bear/tiger conflict can eliminate the weakest animals from both populations (Seryodkin et al. 2005; Seryodkin 2006). Brown bears usually dominate other bear species in areas where they coexist. Due to their smaller size, American black bears are at a competitive disadvantage over brown bears in open, non-forested areas. Although displacement of black bears by brown bears has been documented, actual interspecific killing of black bears by brown bears has only occasionally been reported. The black bear's habit of living in heavily forested areas as opposed to the brown bear's preference for open spaces usually ensures that the two species avoid confrontations in areas where they are sympatric. There has been a recent increase in interactions between brown bears and polar bears. Brown bears have been seen moving increasingly northward into territories formerly claimed by polar bears. Brown bears tend to dominate polar bears in disputes over carcasses, and dead polar bear cubs have been found in brown bear dens (Dye 2005). Giant panda cubs have also been reportedly eaten by brown bears (Brown 1993). Ursus arctos collaris—Siberian brown bear; Siberia (except for the habitat of the Kamchatka and Amur brown bears.) Also in northern Mongolia, far northern Xinjiang, and extreme eastern Kazakhstan. 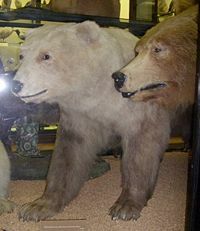 A grizzly–polar bear hybrid is a rare ursid hybrid resulting from a union of a brown bear and a polar bear. It has occurred both in captivity and in the wild. In 2006, the occurrence of this hybrid in nature was confirmed by testing the DNA of a strange-looking bear that had been shot in the Canadian arctic (AP 2008). Previously, the hybrid had been produced in zoos and was considered a "cryptid" (a hypothesized animal for which there is no scientific proof of existence in the wild). The brown bear has existed in North America since at least the most recent ice age, though it is thought that the larger, taller, and stronger giant short-faced bear, or bulldog bear, was the dominant carnivore at the time. The giant short-faced bear was a tall, thin animal adapted to eating large mammals, whereas the grizzly or brown bear has teeth appropriate for its omnivorous diet. The brown bear also shared North America with the American lion and Smilodon, carnivorous competitors. The modern grizzly can eat plants, insects, carrion, and small and large animals. The American lion, Smilodon, and giant short-faced bear had a more limited range of food, making them vulnerable to starvation as the supply of available large mammals decreased, possibly due to hunting by humans. The time of the Arctodus extinction is about the same as the extinction of the long-horned bison and other megafauna. Both of these animals were replaced by Eurasian immigrants, specifically the brown bear and American bison. Since this was also about the same time as the Clovis tool kit hunting culture appeared in North America, with culturally advanced humans entering the Americas from Asia, the implication is that the brown bear was better adapted to human competition than the megafauna, presumably due to a long term coexistence in the Old World with people. The extinction of ice-age herbivorous megafauna resulted in the extinction of the sabertooth, American lion, and giant short-faced bear, leaving the brown bear as the major large predator in North America, with the gray wolf, the jaguar in the south, the American black bear, and cougar also competing for large prey. The origin of human presence in America is widely accepted to have occurred across the Bering Land Bridge with the largest known immigration being that of the Paleo Indians at about the last ice age, bringing with them the Clovis point and advanced hunting techniques. When the last ice age ended about 10,000 years ago, brown bears from farther south in North America slowly expanded their range northward and back up into Alaska. Today there are three genetically distinct grizzly bear clades in North America: The Alaskan-Yukon Grizzly, the Alberta-Saskatchewan lineage, and those found in the Colorado-Washington-Idaho-Montana-Wyoming area. In Europe, the brown bear shared its habitat with other predators such as the cave lion, cave hyena, and the larger, closely related cave bear, which the brown bear ultimately outlasted. The cave bear was hunted by Neanderthals who may have had a religion relating to this bear, the Cave Bear Cult. However, the Neanderthal population was too small for their consumption of cave bear to result in the species' extinction, and the cave bear outlasted the Neanderthals by 18,000 years, becoming extinct about 10,000 years ago. 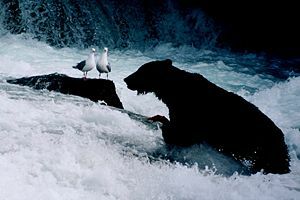 The cave bear and brown bear diets were similar, and the two species probably lived in the same area at the same time. Why the cave bear died out is not known. The Caledonian bear was said to be so fierce that it was favored by the Romans who used them in their amphitheatres. Bears become attracted to human created food sources such as garbage dumps, litter bins, and dumpsters; and venture into human dwellings or barns in search of food as humans encroach into bear habitat. In the United States, bears sometimes kill and eat farm animals. When bears come to associate human activity with a "food reward," a bear is likely to continue to become emboldened and the likeliness of human-bear encounters increases, as they may return to the same location despite relocation. The saying, "a fed bear is a dead bear," has come into use to popularize the idea that allowing bears to scavenge human garbage, such as trash cans and campers' backpacks, pet food, or other food sources that draw the bear into contact with humans can result in a bear being put into a situation where it has to be killed for safety reasons. Relocation has been used to separate the bear from the human environment, but it does not address the problem bear's newly learned humans-as-food-source behavior. Nor does it address the environmental situations which created the human habituated bear. And attracting multiple bears to an area can lead to competition, social conflict, and bear-on-bear injuries and death. Yellowstone National Park, an enormous reserve located in the Western United States, contains prime habitat for the grizzly bear (Ursus arctos horribilis), but due to the enormous number of visitors, human-bear encounters are common. The scenic beauty of the area has led to an influx of people moving into the area. In addition, because there are so many bear relocations to the same remote areas of Yellowstone, and because male bears tend to dominate the center of the relocation zone, female bears tend to be pushed to the boundaries of the region and beyond. The result is that a large proportion of repeat offenders, bears that are killed for public safety, are females. This creates a further depressive effect on an already stressed population size. The grizzly bear is officially described as threatened in the United States. Although the problem is most significant with regard to grizzlies, these issues affect the other types of brown bear as well. In Europe, part of the problem lies with shepherds; over the past two centuries, many sheep and goat herders have gradually abandoned the more traditional practice of using dogs to guard flocks, which have concurrently grown larger. Typically, they allow the herds to graze freely over sizable tracts of land. As bears reclaim parts of their range, they may eat livestock. In some cases, the shepherd will shoot the bear thinking that his livelihood is under threat. Many shepherds are now better informed about the ample compensation available in some areas and will make a claim when a loss to his livestock due to a bear takes place. The grizzly bear, sometimes called the silvertip bear, is listed as threatened in the Continental United States. It is slowly repopulating in areas where it was previously extirpated, though it is still vulnerable. The California golden bear (Ursus arctos californicus) disappeared from the state of California in 1922, when the last one was shot in Tulare County, but it is still on the state flag of California. The bear is alluded to in the names of the sports teams of the University of California, Berkeley (the California Golden Bears), and of the University of California, Los Angeles (the UCLA Bruins), and in the mascot of University of California, Riverside. The Mexican grizzly bear is listed as an endangered species, but it may be extinct. 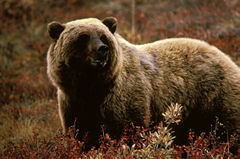 In Canada, the brown bear is listed as vulnerable in Alberta, British Columbia, Northwest Territories, and Yukon Territory. Prairie populations of grizzly bear are listed as extirpated in Alberta, Manitoba, and Saskatchewan. The brown bear is a European Protected Species, given protection throughout the European Union. There are an average of two fatal bear attacks a year in North America (Herrero 2002). In Scandinavia, there are only four known cases since 1902 of bear encounters that have resulted in death. The two most common causes for bear attack are surprise and curiosity (Smith and Herrero 2007). Some types of bears, such as polar bears, are more likely to attack humans when searching for food, while American black bears are much less likely to attack. ↑ B. N. McLellan, C. Servheen, and D. Huber, "Ursus arctos,", 2008 IUCN Red List of Threatened Species (IUCN 2008). Retrieved December 28, 2008. Associated Press (AP). Wild find: Half grizzly, half polar bear. Hunter bags what expert "never thought would happen" in wild. MSNBC. Retrieved December 28, 2008. Bear Facts (BF). n.d. Types of bears in the Yukon. Bear Facts. Retrieved December 28, 2008. Bellemain, E., J. E. Swenson, and P. Taberlet. 2006. Mating strategies in relation to sexually selected infanticide in a non-social carnivore: The brown bear. Ethology 112(3): 238-246. Brown, G. 1996. Great Bear Almanac. New York: Lyons & Burford. ISBN 1558212108. Cameron, W. 2005. Learn to identify black bears and grizzly (brown) bears. Mountain Nature. Retrieved December 28, 2008. Department of Commerce, Community, and Economic Development (DCED), State of Alaska. n.d. Alaska is bear territory. State of Alaska. Retrieved December 28, 2008. Dewey, T., and L. Ballenger. 2002. Ursus arctos. Animal Diversity Web. Retrieved December 28, 2008. Dye, L. 2005. Grizzlies encroaching on polar bear country. ABC News March 16, 2005. Fish and Wildlife Service (FWS), United States. 2005. Endangered and threatened wildlife and plants; Designating the Greater Yellowstone Ecosystem population of grizzly bears as a distinct population segment; Removing the Yellowstone distinct population segment of grizzly bears From the Federal List of Endangered and Threatened Wildlife. Federal Register 70 (221) U.S. Fish and Wildlife Service. Retrieved December 28, 2008. Herrero, S. 2002. Bear Attacks: Their Causes and Avoidance, revised edition. Guilford, CT: Lyons Press. ISBN 158574557X. Macdonald, D. 1984. The Encyclopedia of Mammals. London: Allen & Unwin. ISBN 004500028X. Matthiessen, P., and M. Hornocker. 2001. Tigers In The Snow. North Point Press. ISBN 0865475962. Mazak, V. 2004. Der Tiger: Panthera tigris. Nachdruck der 3. Auflage von 1983. Westarp Wissenschaften Hohenwarsleben. ISBN 3894327596. McLellan, B. N., C. Servheen, and D. Huber. 2008. Ursus arctos. In IUCN, 2008 IUCN Red List of Threatened Species. Retrieved December 28, 2008. Nikolaev, I. G., and V. G. Yudin. 1993. Conflicts between man and tiger in the Russian Far East. Bulletin Moskovskogo Obshchestva Ispytateley Prirody 98(i):3. Retrieved December 28, 2008. Reed, T. 2006. Yellowstone grizzly bears eat 40,000 moths a day in August. YellowstonePark.com/Yellowstone Journal Corporation. Retrieved December 28, 2008. Russian Hunting Agency (RHA). 2007. Brown bear hunting in Russia. Russian Hunting Agency. Retrieved December 28, 2008. Seryodkin, I. V. 2006. The ecology, behavior, management and conservation status of brown bears in Sikhote-Alin (in Russian). Vladivostok, Russia: Far Eastern National University. Retrieved December 28, 2008. Seryodkin, I. V., J. M. Goodrich, A. V. Kostyrya, B. O. Schleyer, E. N. Smirnov, L. L. Kerley, and D. G. Miquelle. 2005. Relationship between tigers, brown bears, and Himalayan black bears. Pages 156-163 in D. G. Miquelle, E. N. Smirnov, and J. M. Goodrich (eds. ), Tigers of Sikhote-Alin Zapovednik: Ecology and Conservation. Vladivostok, Russia: PSP. Shadow of the Bear (SOTB). n.d. Brown bear reproduction. Shadow of the Bear. Retrieved December 28, 2008. Smith, T. S., and S. Herrero. 2008. A century of bear-human conflict in Alaska: Analyses and implications. Alaska Science Center, Biological Science Office. Retrieved December 28, 2008. Waits, L. P., S. L. Talbot, R. H. Ward, and G. F. Shields. 1998. Mitochondrial DNA phylogeography of the North American brown bear and implications for conservation. Conservation Biology 12(2): 408-417. Retrieved December 28, 2008. Wood, G. L. 1983. The Guinness Book of Animal Facts and Feats. Sterling Pub Co. ISBN 9780851122359. This page was last modified on 6 July 2016, at 22:43.